My hope is that my new ministry will be a manifestation of the theme of my ordination, "Growing in Spirit to Help Heal the World." It will be grounded in a strong belief that Unitarian Universalists have something wonderful to offer the world -- an extraordinary way to be together and a vision for a better world. 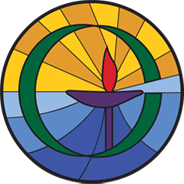 Our extraordinary Unitarian Universalist culture is flexible enough to adapt to the unique characteristics of each congregation. We will grow in spirit as the needs and wants of the congregation present themselves. We will help heal our world in ways that leverage the strengths of the congregation. 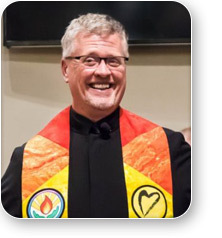 My own Unitarian Universalist experience comes out of the Fellowship tradition in which there is a tight bond between the minister and lay leadership. The congregation is a collective and together we minister to each other. 10:00 AM - Every Sunday: Full worship service or speaker on social/spiritual topics.